Accept all nationalities, any already in my country, native English Speakers, EU nationals. We are looking for an Au Pair to join our family and live with us for at least a year. 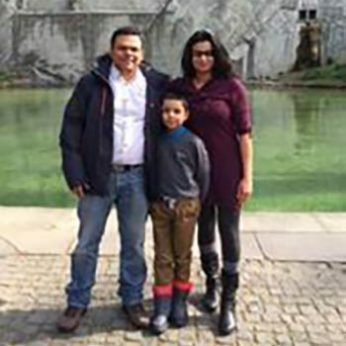 We are a small family living in lovely water front town of Ipswich in Suffolk, We would be moving to a five bedroom detached house in January before the aupair joins us.. I’m Purva, and my husband is called Sachin. My elder son, Kavish, is 11 years old and the younger one is 2 yrs old. Both of us are medical professionals working in the NHS. The Au Pair will have her own room and the family are members of the private David Lloyd gym/fitness/sports centre so they will give the aupair use of their guest pass. The town centre is very close to where we live and so are the docks. We are looking for an aupair to come and live with us from april 2019. She will be expected to do some babysitting on weekends. The Au Pair will also be expected to help around in the house (cleaning or tidying the house, making beds, clearing the dishwasher etc). School /nursery runs only in emergency/look after baby if sick and off nursery. We would like the Au Pair to be responsible, caring, enthusiastic and passionate and flexible. We would prefer with child/baby care experience.. I hope that my letter provides you with an insight into our family. If you think you might like to come to our family, please let me know. I look forward to hearing from you. She will need to help me with chores around house -cleaning ,washing ,iron ,tidy house and kitchen, minor cooking if needed-especially first few mths ,she should also be experienced in baby care ,to look after baby if i am on school run etc .ideal age preferred around 30 and above but younger candidates with baby experience is a must. Basically help in house as needed as will need help with household work and keeping house tidy after my newborn arrives in feb.